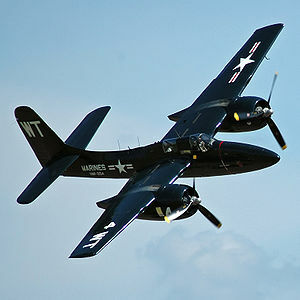 The Grumman F7F Tigercat was the first twin-engined fighter aircraft design to enter service with the United States Navy. Designed for the new Midway-class aircraft carriers, the aircraft were too large to operate from earlier decks. Although delivered to United States Marine Corps (USMC) combat units before the end of World War II, the Tigercat did not see combat service in that war. Most F7Fs ended up in land-based service, as attack aircraft or night fighters; only the later F7F-4N was certified for carrier service. They saw service in the Korean War and were withdrawn from service in 1954. A number of Tigercats were used as water bombers to fight forest fires in the 1960s and 1970s, and for this reason 12 examples exist today. Six of these are still airworthy. As warbird racers, in 1976, Robert Forbes qualified an F7F-3N but did not race at Reno. Another modified F7F-3N Tigercat, (Bu No. 80503) "Big Bossman" owned by Mike Brown presently competes in the national air racing circuit.